It was worse than a crime, it was a blunder on this date in 1804. Napoleon shocked, just shocked, his admirers and more especially his foes by having a royal relative ventilated at Vincennes for the trifling offense of plotting against his life. The particular allegations against him may have been formulated with greater haste than precision, but the duc d’Enghien actually had been taking English coin to overthrow Republican France for the past decade, and nonchalantly avowed as much at his drumhead tribunal. 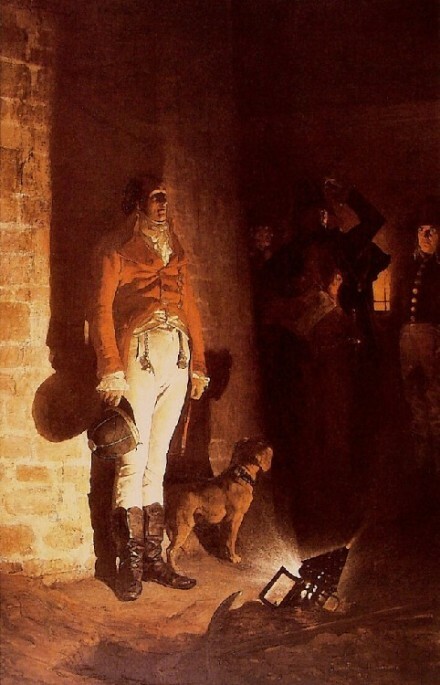 The Duke awaiting execution in the predawn gloom in the moat of the Chateau de Vincennes. The pathos of the accompanying dog is mandatory for this scene, as in this Harold Piffard illustration. This spot is now marked with a monument. After surviving one too many assassination attempts, Napoleon was in the market for someone to make an example of, and the Bourbon scion, hanging about the French frontiers conniving with the English, certainly qualified. The dispatch of his military commission, which rammed through a conviction the night of the 20th and arranged the fusillade immediately thereafter, raised self-righteous hackles among rival monarchs who had little enough compunction of their own about politically expeditious regicide. Conventional disdain for the shooting (as with this (pdf) from the Fourth Estate), reached far and wide, and appears in Tolstoy’s War and Peace as a subject for (spurious) gossip in the Russian salons. The group about Mortemart immediately began discussing the murder of the Duc d’Enghien. The vicomte said that the Duc d’Enghien had perished by his own magnanimity, and that there were particular reasons for Bonaparte’s hatred of him. The vicomte told his tale very neatly. It was an anecdote, then current, to the effect that the Duc d’Enghien had gone secretly to Paris to visit Mademoiselle George; that at her house he came upon Bonaparte, who also enjoyed the famous actress’ favors, and that in his presence Napoleon happened to fall into one of the fainting fits to which he was subject, and was thus at the duc’s mercy. The latter spared him, and this magnanimity Bonaparte subsequently repaid by death. 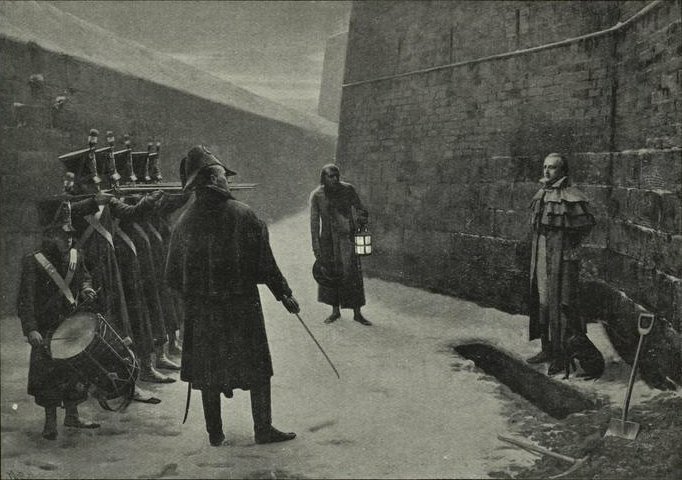 Pierre Bezukhov, the novel’s spirit-questing Russian noble then in the thrall of the Little Corporal, has the rashness to defend d’Enghien’s execution. 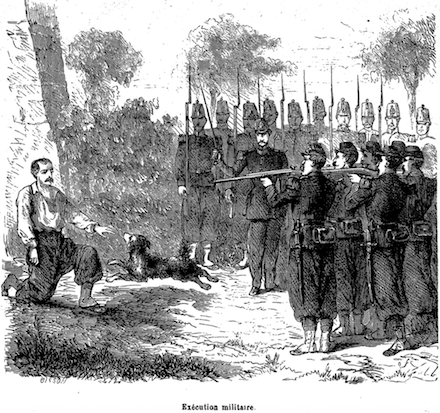 Though that defense went over like a lead balloon with the partygoers (and with Tolstoy), others have ventured to stand in the breach for the Corsican, who assuredly attracts far more opprobrium as a commoner shooting a royal traitor than he would have had their bloodlines been reversed. Bonaparte enthusiasts, like those of the Napoleon podcast, are particularly susceptible to such impolitic sentiment. But Louis-Antoine-Henri normally gets better sympathy than that, as he did with the like of Chateaubriand, who resigned his Napoleonic commission in outrage. And his death — far more notable than anything he did in life — is supposed to have occasioned the quip, “C’est pire qu’un crime, c’est une faute”: “it is worse than a crime, it is a blunder.” (Or, “it is worse than a crime, it is a mistake.”) Often attributed to Talleyrand, it was more likely uttered by his machiavellian mirror image, Joseph Fouche. The First Consul — he would crown himself Emperor later in 1804 — never had use for any such soft-pedaling, and unapologetically avowed the Duke’s execution literally to the end of his life. Dying in exile on St. Helena years later, it is said, Napoleon read a calumny upon the d’Enghien shooting in the English press and promptly hauled out his already-completed will to insert in his own hand his lasting justification for the affair. I caused the Duc d’Enghien to be arrested and tried, because that step was essential to the safety, interest, and honour of the French people, when the Count d’Artois* was maintaining, by his own confession, sixty assassins at Paris. Under similar circumstances, I should act in the same way. * The Comte d’Artois was, at the time of Napoleon’s writing, the heir presumptive to the restored Bourbon monarchy — and he did indeed succeed in 1824 as Charles X. In 1804, the future king was in exile in Britain funding hits on Bonaparte and kindred counterrevolutionary stuff. For adherents of the much-disputed theory that Napoleon was poisoned in his island captivity, d’Artois figures as a possible instigator of the murder.